Objective: To explore surgical residents’ perceptions regarding their current laparoscopic training, and to determine their opinions regarding the current methods of teaching laparoscopic suturing in a surgical skills laboratory. 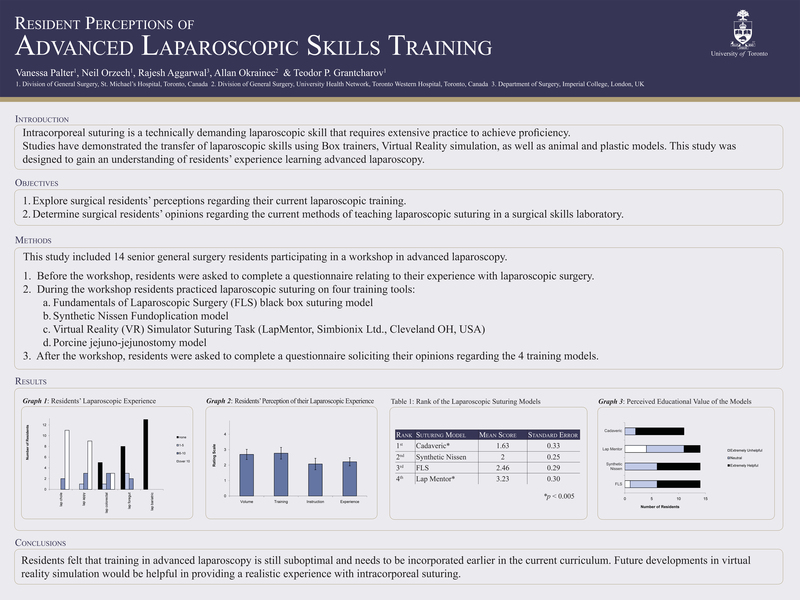 Methods: This study included 16 senior general surgery residents participating in a workshop in advanced laparoscopy. Four training tools were used in the course curriculum: the Fundamentals of Laparoscopic Surgery (FLS) black box suturing model, a Synthetic Nissen Fundoplication model, a Virtual Reality (VR) Simulator Suturing Task (LapMentor, Simbionix Ltd., Cleveland OH, USA), and a porcine jejuno-jejunostomy model. After the workshop, residents were asked to complete a questionnaire relating to their experience with laparoscopic surgery and their opinions regarding the 4 training models. Descriptive statistics were utilized for data analysis. Results: Fourteen (9 male) of the 16 residents enrolled in the workshop completed the questionnaire. The majority of the residents had observed and performed over 40 laparoscopic cases. On average, residents act as primary surgeons on laparoscopic cases 2-5 times per month, as first assistant 1-5 times, and as observers 1-5 times. The participants had performed over 10 laparoscopic cholecystectomies and appendectomies, >8 laparoscopic colorectal procedures and no laparoscopic foregut surgery. Half of the residents felt that their exposure to advanced laparoscopy was insufficient. The vast majority of residents felt that they had not received adequate instruction in laparoscopic suturing (median 1 on a 5 point Likert scale), and did not feel proficient with this technique. At the end of the workshop, residents ranked the animal model as their preferred training tool for laparoscopic suturing, followed by the FLS black box, with the VR Simulator Task being the least preferred tool. When asked to rank each task individually however, the majority of residents ranked each task as being “moderately helpful” or better (5-7 on a 7 point Likert scale). Conclusions: Training in advanced laparoscopic skills is still suboptimal and needs to be incorporated early in the residency curriculum. Future developments in VR simulation are necessary to provide a realistic experience with intracorporeal suturing.